Certain types of ballplayers have always populated baseball history. Slow footed sluggers, crafty lefthanders, flame throwing relievers and flashy infielders all make up important baseball clichés. Hall of Famer Max Carey demonstrates all of the qualities of one such type -- a hard working, fundamentally sound outfielder with great speed, sure hands, and good contact with a touch of power. These traits, commonly found in the early days of baseball, seemed less important in the Ruthian era in which Carey starred. His career thus represents a bridge from the bunting and speed game to the lug and slug home run era. Maxmillian George Carnarius made his first slide on January 11, 1890, in Terre Haute, Indiana, the son of August and Catherine (Astroth) Carnarius. In Latin, his name means "handler of meat," but his father had forgone the family business for a career as a soldier and a swimming teacher in his native Prussia. After the Franco-Prussian war, he immigrated to the United States, where he became a contractor. Max's parents desired a disciplined education for their son. At age 13, he was enrolled in a six-year pre-ministerial program at Concordia College in Fort Wayne. The demanding program (which also included some military training) did include a good amount of physical education, and young Max excelled at swimming and track. After graduating in 1909, he was sent to Concordia Seminary in St. Louis to fulfill his parents' dream and become a Lutheran minister. Baseball would soon get in the way. Although it was not his best sport, Max had played the infield for Concordia College's team and was noted for his speed and agility. In the summer of 1909, he attended a Central League game in Terre Haute. The opposing team from South Bend had recently sold their shortstop to a higher league, and after the game, Carnarius tracked down their manager, Aggie Grant, at their hotel. Showing him a school track medal, he asked Grant if he could be the team's new shortstop. Needing to fill the hole in his lineup, Grant told him to report the next day, and he stayed in the lineup for the rest of the season. Although he did not distinguish himself at either the plate or in the field, he did earn a new name out of the experience. Although other accounts would erroneously report that his manager and the umpire could not pronounce his real name, the real story was even simpler. Max did not want to use his real name and lose his amateur standing, so he asked his manager to give him a new name. Grant told the umpire when lineups were announced that his new shortstop was named "Carney or Carey or something like that". The umpire recorded his name as "Max Carey," and it would stick for the rest of his life. On the field, Carey hit only .158 with 24 errors in 48 games, and he returned to the seminary in the fall of 1909. However, the damage to his parents' dreams had been done. Carey questioned the point of spending money on years of schooling, when he could be making money playing baseball. After spending another year at school in St. Louis, he went back to the South Bend team in the spring of 1910, hoping for another chance. The team's new manager told him that he already had a shortstop, but there was a need in left field if Carey thought he could do the job. Leaving the seminary for good, Carey took over in the outfield and this time had an excellent season. In 96 games, he hit .298 with an electrifying total of 86 stolen bases, and threw out 25 base runners from the outfield. His great play earned him the recommendation of the league president to the Pittsburgh Pirates, who bought him in the last days of the 1910 season. Reporting to the Pirates, Carey took the field at shortstop in hopes of returning to his favorite position. Greeting him on the diamond was, of course, the legendary Hall of Famer Honus Wagner. According to a story he loved to retell in later years, Carey naively told him that he was here to be the new shortstop. Controlling his temper, Wagner asked Carey to "wait a minute" while he went to speak to the team's player/manager, Fred Clarke. According to the story, Wagner told Clarke that while he was going to be at shortstop to stay, if he thought Carey had a chance to make the club then he should retire from playing and let the rookie play his left field position. Ironically, Wagner and Carey developed a strong friendship over the years, but a clash with Clarke would lead to the end of his Pirate career. Whatever the truth of the matter was, Carey did replace Clarke in the lineup for the final two games of 1910, and remained a fixture in the Pittsburgh outfield for the next sixteen seasons. His Pirate career was marked by steadily consistent offensive and defensive production, mingled with moments of spectacular greatness. At the plate, he enjoyed five full seasons of averages over .300, and was on the way to a sixth when stopped by an injury in 1919; that campaign would be the only one between 1911 and 1928 in which he played fewer than 108 games. Although not a power hitter, he used his speed in roomy Forbes Field to lead the league in triples twice and reach double figures in this category in nine seasons. A patient hitter who walked more than twice as much as he struck out, Carey frequently found ways to get on base, including one memorable 1922 afternoon in which he reached base nine times in an extra-inning marathon, and had nine five-hit games in his career. On the base paths, Carey became a deadly threat, stealing 738 bases in his career and leading the National League ten times. In an era when the average base stealer was thrown out roughly half of the time, Carey stole 31 bases in a row in 1922, on his way to an eye popping total of 51 steals in 53 attempts. Early in his career Max was nicknamed "Scoops," in homage to a Pittsburgh-born first baseman (his real name was George) who played sporadically from 1895 to 1903. However, contemporary pundits suggested that "Hawk" would be more appropriate, in light of his defensive prowess. Carey covered both left and center field for the Pirates and excelled in both positions. He retired holding a major league record of six seasons with over 400 putouts, including a remarkable 450 in 1923. He led all other NL outfielders in range factor seven times, in assists four times, and in double plays five times. His 339 outfield assists remain as the highest total of any National League outfielder since 1900. He also led the league in outfield errors four times, running into errors trying to catch drives other players would not have attempted. Carey's career achievements look even more remarkable when one realizes that they were the products of a self-made player. The once nervous .158 batting divinity student made himself into a superb all-around ballplayer by continuously adapting and developing his one natural gift of speed. He listened intently to Wagner's tips on conditioning his legs and watching the pitcher's move to first base. Concerned over the possibility of her son sustaining a sliding injury, Carey's mother sewed him a sliding pad that he soon patented. (It was still in use many years after his career ended.) According to a letter from his wife in his Hall of Fame file, Max Carey was the first player to use flip-down sunglasses in the outfield, supposedly adding this to his repertoire several years before Harry Hooper was known to do so. After watching Ty Cobb hit in a 1924 spring training game, Carey remodeled his batting stance and went on to have the most productive offensive season of his career in 1925, batting .343 as the Pirates won the National League pennant. Max Carey would display all of his talents in the World Series of that year, as the Pirates faced off against the defending champion Washington Senators. Despite Carey's best efforts, the team fell into a 3-1 hole but rallied back to win the next two games. Facing the Pirates in the decisive Game 7 was legendary Hall of Famer Walter Johnson, who had already won two games in the Series. However, the shrewd Carey had done his homework. 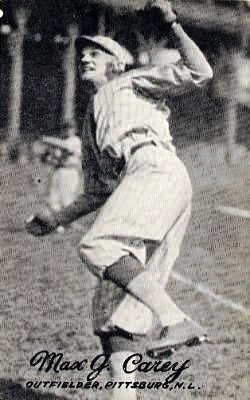 Acting on a tip given to him prior to the Series by Detroit outfielder Bobby Veach, he discovered a flaw in Johnson's game. Whenever Johnson shortened his delivery, he tipped off his much less effective curveball. Carey sat on Johnson's curves in Game 7 and rapped out four hits (including 3 doubles) and stole a base as the Pirates rallied to a 9-7 victory. Had such an award been in existence, Carey would have been the Series MVP, batting .458 with 11 hits and 3 stolen bases. Following the Series, he received a new contract for $16,000, making him the highest paid player on the team. However, the 1925 Series was Max Carey's swan song as an active player for the Pittsburgh Pirates. Former manager Fred Clarke, who had given his spot in the outfield to Carey back in 1910, was now only a stockholder in the club. However, Clarke enjoyed sitting on the bench as an "assistant" to manager Bill McKechnie and frequently second-guessed his decisions. Clarke's meddling led to dissension within the clubhouse, which boiled over after an embarrassing doubleheader loss in Boston on August 7, 1926. Along with veterans Carson Bigbee and Babe Adams, Carey called a team meeting and attempted to pass a resolution banning Clarke from the bench. As the team's captain, Carey felt that he should represent the players in their dispute, and his stand resulted in his becoming the fall guy for the whole ugly affair. In what would be known as the "great Pirate mutiny," Pirate owner Barney Dreyfuss foiled Carey's uprising by first suspending and then waiving his star outfielder and team captain. Carey was quickly claimed by the Brooklyn Robins and finished out his career there in the next two seasons. Carey retired after the 1929 season, with career totals of 2,665 hits, 738 stolen bases, and a .285 lifetime batting average. In 1930, old wounds were healed when the Pirates welcomed Carey back as a coach. Following the 1931 season. Brooklyn's long-time manager Wilbert Robinson was relieved of his post, and Max Carey was announced as his successor. Promising that the Dodgers would take a more scientific approach to the game, Carey attempted to introduce his "inside baseball" style of play, with a heavier emphasis on bunting and speed. In that spirit, Carey traded away popular slugger Babe Herman and put most of the other players on the trading block. In 1932, his "modern" system resulted in a surprising 3rd place season, and Carey drew special praise for his ability to coax a strong season out of unpredictable outfielder Hack Wilson. In 1933, the bubble burst as age and questionable personnel moves saw the team fall to sixth place. Carey went to spring training in Miami in 1934 speaking confidently of a strong season, optimistic talk which the Brooklyn press called the "newest wonder of the world." However, before the season started coach Casey Stengel replaced him as manager. Carey later remarked that "he was the first manager fired by the newspapers" and remained resentful of the team's front office machinations. Still, he left one lasting legacy for the franchise. After succeeding Robinson, the team dropped its nickname of Robins and reverted to their early name of "Dodgers" (one writer suggested they should take the name "Canaries," but that did not stick). Carey invested heavily in Florida real estate, and lost over $100,000 in the stock market crash of 1929. He was able to maintain one steady source of income by sharing a patent on a liniment known as Minute-Rub. He consistently sought and found work in baseball for the rest of his life. He co-owned a baseball school in Ft. Lauderdale, toured Japan with an amateur team, and served as a manager and general manager of the Miami team in the Florida Coast League in 1941-1942. In 1944 he began the most unusual part of his baseball career when he was hired to manage the Milwaukee club in the All- American Girls Professional Baseball League. After winning the pennant that season, he served as the league's president through 1950. Carey worked both to improve the level of play and public interest in the league. He took a friendly but firm approach to his players, stressing the fundamentals of his stealing and bunting techniques. He also helped the league through his tireless and unceasing promotion. Carey often invited former teammates and opponents to see his female teams play, with the point of surprising them with their high level of ability. He told anyone who would listen that the quality of play in the AAGPL was as high as any in professional ball, and later spoke of this period as "his happiest" of all his baseball days. During the 1950s Carey spent most of his time writing, working on a self-published book on baseball strategy and tactics and then authoring several magazine articles. In one controversial article for Esquire in 1955, he listed his 20 greatest players of all time. While selecting his old teammate Honus Wagner 1st, Carey ranked Babe Ruth a mere 18th due to his opinion on the relative importance of home runs to bunts. After narrowly missing out on election for several years, Carey earned his highest honor when he was voted into the Hall of Fame in 1961. Ironically, the good news of his election came the same day as the bad news of his impending unemployment. Carey had been serving as the chief judge of the Miami dog racing authority, but was dismissed due to a change in state government. Undaunted, he made a rousing speech at his induction on July 24, 1961, thanking the staff of The Sporting News and calling on the major leagues to expand baseball in Florida. Max Carey remained active in his final years. He made the circuit of old-timers games and post-season banquets, remaining much in demand for his outspoken opinions and knack for story-telling. Carey gave a number of interviews to newspapers and sports, and frequently wrote to Hall of Fame historian Lee Allen to help the latter with various research projects. He enjoyed corresponding with fans about the modern game and fielded a steady stream of autograph requests. Settling down in Miami Beach, he and his wife of 65 years raised two sons who became chemical engineers. One of Carey's pet issues became the lack of a pension fund for old time players. After serving as a pallbearer for fellow Miami resident Jimmie Foxx, Carey bemoaned the system that paid modern players comparatively high salaries while allowing Foxx to live out his final years in obscurity and near-poverty. He even dedicated some time to politics, hitting the campaign trail in 1968 in support of Richard Nixon. "Never run the bases with your head down-keep your head up and see what is going on. Base running judgment comes from the eyes. Use them! "And don't be sloppy. Keep your uniform looking nice. Be a gentleman on and off the field." Whether an original or an archetype, we could use more players like Carey in baseball today. Note: An earlier version of this biography appeared in Tom Simon, ed., Deadball Stars of the National League (Washington, D.C.: Brassey's 2004). Interviews with Alma Ziegler and Dotty Kamenshek. Browne, Lois. Girls of Summer: In Their Own League. New York: HarperCollins, 1992. Cohen, Stanley. Dodgers: The First 100 Years. New York: Carol Books, 1992. Goldstein, Richard. Superstars and Screwballs. New York: Dutton, 1991.